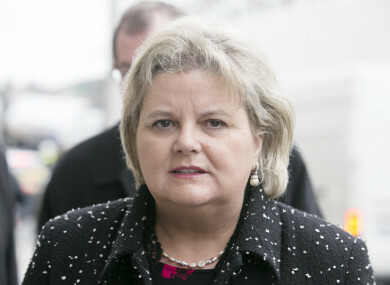 Angela Kerins had sought damages from the PAC following a 2014 hearing. The case has been adjourned until April. THE SUPREME COURT has found that the Public Accounts Committee (PAC) acted “significantly outside its remit” in its questioning of former Rehab CEO Angela Kerins. The court found in favour of Kerins today, after she appealed a High Court finding that PAC’s questioning of her in 2014 was inappropriate. The ruling means that the court may find the committee’s questioning of Kerins was unlawful, overturning a High Court decision from 2017. Kerins had sought damages from committee for distress, public humiliation, and the loss of her career following her appearance before the committee in February 2014. The High Court previously heard that she had made an attempt on her own life following the hearing, and that she subsequently resigned as CEO of Rehab on 2 April 2014. However, its 2017 ruling found that courts have no jurisdiction to intervene or award damages arising from Dáil hearings, ruling that to do so would breach the separation of powers. In his ruling today, Chief Justice Frank Clarke ruled that the court had the power to find that PAC’s actions unlawful because the committee acted outside its remit, agreeing with the Oireachtas Committee on Procedures and Privileges, which had also come to that conclusion. “In the circumstances of this case, the court has concluded that it would not be a breach of the separation of powers for the court to declare the actions of the PAC unlawful,” he said, adding that PAC had acted “significantly” outside of its terms of reference. The judge also said that it might be possible to find that the PAC invited Kerins to attend the hearing on one basis, but questioned her on a different basis when she did attend. The court found in favour of Kerins, but said it needed to give further consideration to a number of issues before reaching a final conclusion on her appeal. A final decision in the case was adjourned until 8 April, with the judge saying the court needed to consider who the defendants in the case are and whether Kerins is owed damages. Comments are closed as this case is still before the courts. Email “Supreme Court finds PAC acted 'significantly' outside remit in questioning of former Rehab CEO Angela Kerins”. Feedback on “Supreme Court finds PAC acted 'significantly' outside remit in questioning of former Rehab CEO Angela Kerins”.